Pro: How to be Sick: A Buddhist-Inspired Guide for the Chronically Ill and their Caregivers is my favorite book about the journey of illness. Toni Bernhard does not sugarcoat her experience of coping with chronic fatigue syndrome. From that space of openness, you are lead to see that no matter what your circumstances, you have a way out of suffering. Con: As stated on the cover, the book is rooted in Buddhism. While I believe Bernhard’s message transcends all faiths, this may be a consideration for you. The first line that caught my attention is on the second page of the forward by Silvia Boorstein. It reads, “She knows the cycle of hoping and feeling disappointed from the inside out as well as the cycles of deciding to give up hope in order to avoid the pain of disappointment and the sadness and then the relief of surrender.” I have long felt that hope, as beautiful a word as it is, has the potential to block us from accepting the reality we may find ourselves in. Hope can build up expectations, walls that always keep us wanting something different than we have. Becoming sick, in a way that isn’t relieved with some Nyquil and orange juice, will bring you nose-to-nose with desires for things you don’t have the energy or health for. Toni Bernhard found herself in this space when she got sick in 2001 and never recovered. Her diagnosis of chronic fatigue syndrome has severely diminished her energy and causes her to feel as if she has the flu much of the time. She had to completely adjust her life and career to accommodate her body. Her book explores the Buddhist principles that have helped her mindfully cope with the challenges she faces. She talks about topics such as the spirit behind the illness that is not sick, how to find joy in any circumstance and navigating a relationship impacted by illness. The book is deeply personal and highly insightful as she compassionately explains a variety of concepts in Buddhism and how to apply them to being sick. Bernhard also devotes a section in her book to one of my favorite spiritual teachers, Byron Katie. Katie is known for her practice called, "The Work" which helps people investigate thoughts which create suffering. This practice is a gem at creating presence and opening your eyes to how thoughts can effortlessly sway us from remaining centered. The last portion of the book is an easy-to-navigate reference guide where you can look up what is bothering you and read practices that can assist you to move through pain, worry, blame, uncertainty and isolation. 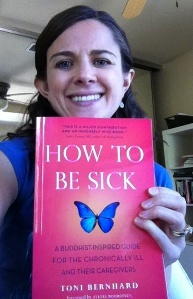 If you have a diagnosis, I highly recommend Toni Bernhard’s How to be Sick. It is a treasure for the chronically ill and their caregivers alike.